Modern, fun, soothing - the coastal vibe is reflective of a design aesthetic that embraces color, light and lots of character. 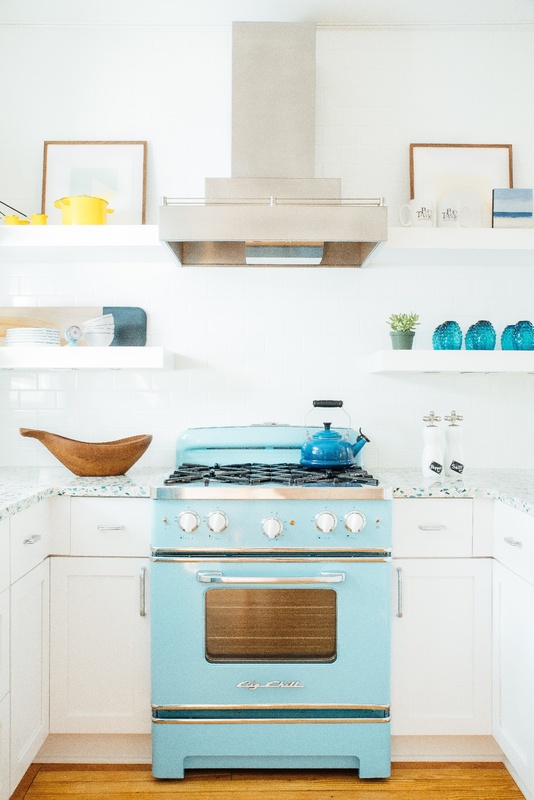 Even kitchen appliance brands are getting into the beachy groove, breaking out of the stainless steel and white mold, launching new styles and colors reflective of Mother Nature. Kitchen design by Laura Umansky for a Gulf Coast Texas get away home features Vetrazzo Floating Blue and a Big Chill fridge in Beach Blue. Many interior designers are simply looking to their local coastlines for color and decor inspiration. Driftwood, shells, glass reflective like water - all take centerstage. 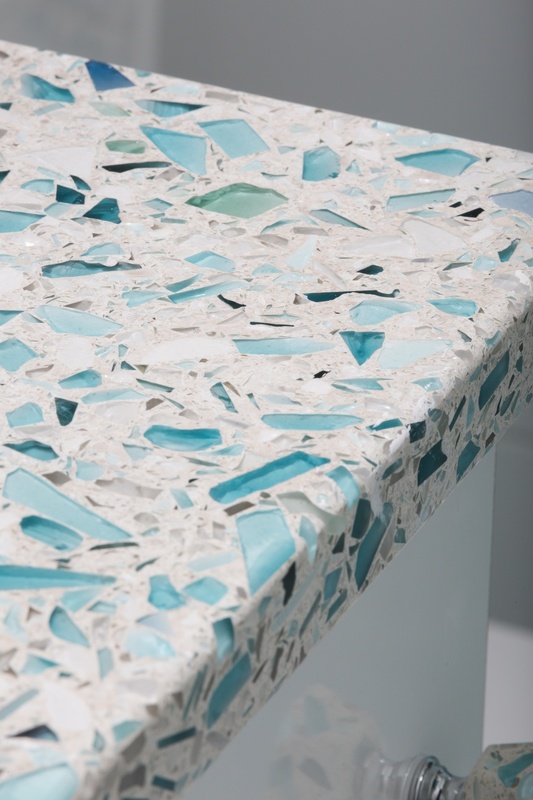 Vetrazzo does the same taking oyster shells and marble chips from Polycor’s adjacent white marble quarry in Tate, Georgia to craft several popular colors. These include Amethystos, Bretagne Blue, Umbo White and Emerald Coast. 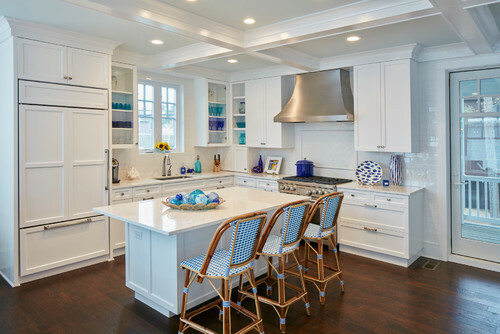 Cortney Bishop kitchen design for a Sullivan Island, South Carolina home featuring a Big Chill range in Beach Blue and Vetrazzo’s Bretagne Blue recycled glass countertops. Designer Stephanie Rothbauer used Vetrazzo’s Martini Flint glass countertops alongside touches of nature like these driftwood candles and custom wood cabinets, for a look styled for her central California coast. 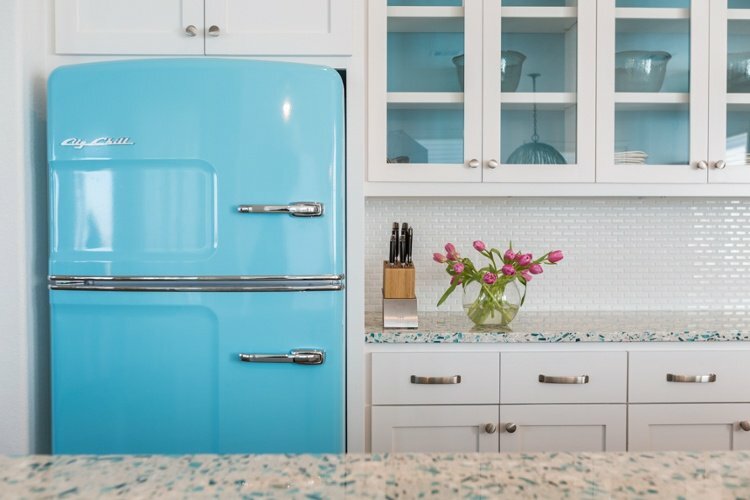 And this spring, Houston interior designer Laura Umansky launched four new Vetrazzo colorways including her favorite Fair Pearl, which features bits of opalescent pearl and glass. Whether she's designing an ultra modern kitchen, or an update to a historic home like her own, Laura begins with a soothing neutral base and adds layers of rich colors and cheerful metallics to create exuberant spaces. She the creamy color of Fair Pearl so much she installed in her own personal kitchen below. Tactile home decor materials are in high demand and interior designers and their clients find surfaces like Vetrazzo’s Sea Pearl take coastal cool to the extreme. 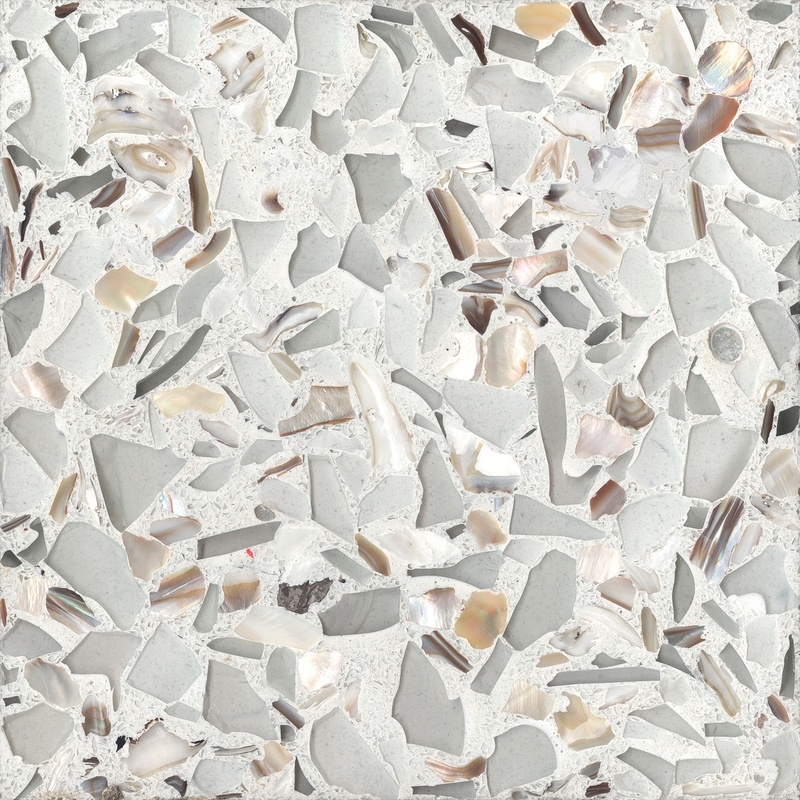 Incorporating pieces of US recycled and salvage glass into its jewel like surfaces, Sea Pearl is reminiscent of a beach comber’s favorite treasure, the sparkly and smooth pieces of sea glass. These new handmade surfaces turn any space into a focal point, just like those ocean views out your windows. Floating Blue recycled glass countertops with Sea Pearl finish in this girl’s bathroom in a home on the New York coast.  Design by Toni Sabatino. 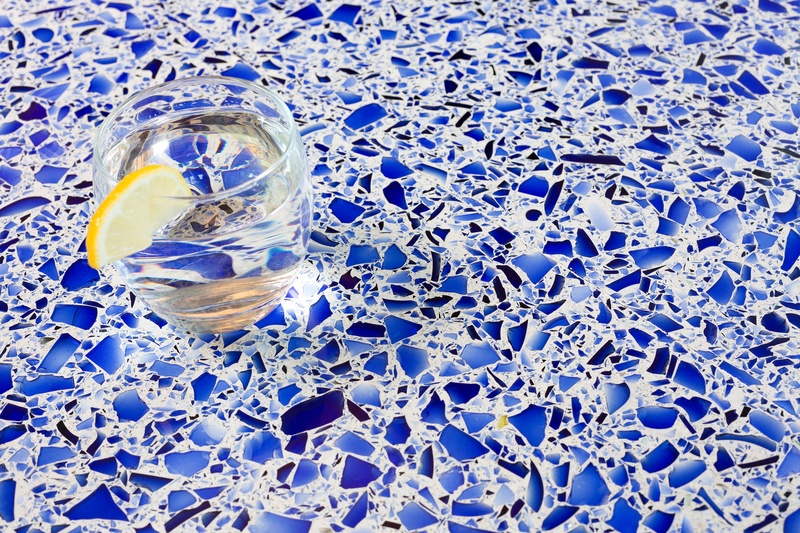 The Sea Pearl finish can be applied to any of Vetrazzo’s color selections that feature large pieces of glass. The large aggregate pieces offer more perspective in the soft undulations between the resin and glass itself. Read more about the Sea Pearl finish here. 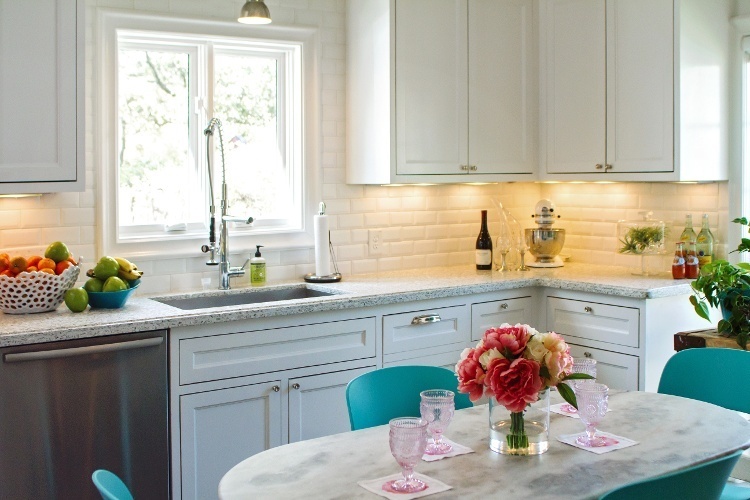 Coastal cool character wouldn’t be complete without a mix of bright and bold patterns in the kitchen. 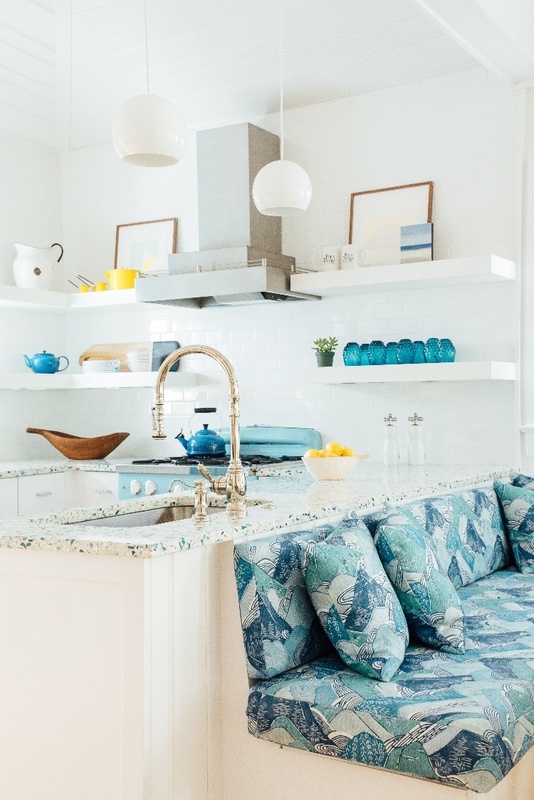 Vetrazzo pairs well with modern beach chic textiles like upholstery, curtains and rugs set against bright white cabinets, backsplashes and walls. The home shown here was featured in Coastal Living magazine. Cortney Bishop kitchen design for a Sullivan Island, South Carolina home featuring Big Chill range in and Vetrazzo’s Bretagne Blue recycled glass countertops. Most importantly, coastal chic perfection would not be possible without a solid foundation. Before adding your layers of color and texture the experts say wash your home in white. The Beach Build designer also recommends incorporating white wall paneling and molding. Some of her favorites are beadboard, shiplap, and crown molding over doors and windows. Oursler suggests if you want to test the waters, start with something small, like a chair rail in a powder room. Even if you don’t live anywhere near the coast. 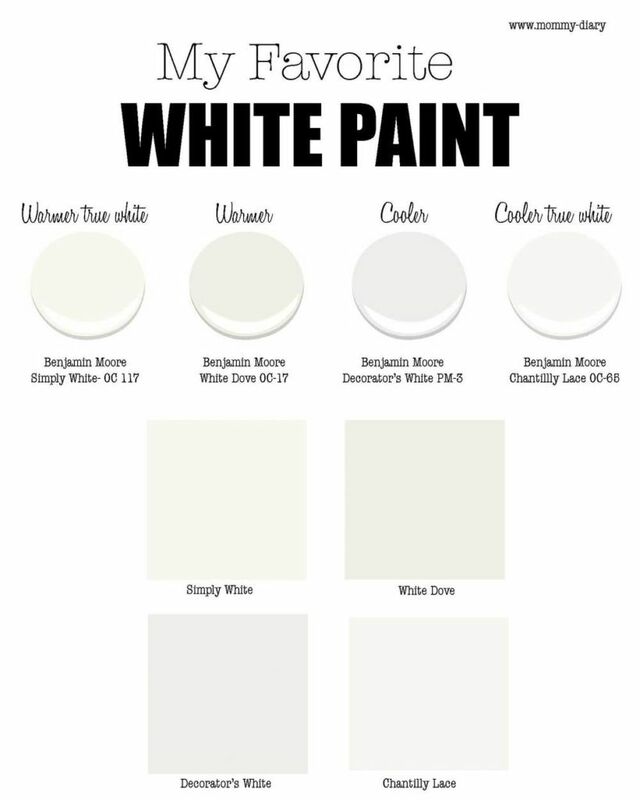 Paint companies offer a wide variety of whites (hundreds of them, in fact). It’s enough to make your head spin but you can’t go wrong if you bring your Vetrazzo samples and textile swatches to pick out just the right shade of white for your kitchen. One of our favorites is Decorator’s White by Benjamin Moore. There are tons of resources online to help you navigate the whitewater. And you can always lean on the advice of those brave remodlers who have gone before you in the quest for the perfect white. Here’s a simple graphic that helps make the choice a little less overwhelming. We love the look of this kitchen by David Weekley for its soft pallete of driftwood and pale aqua layered over creamy white. 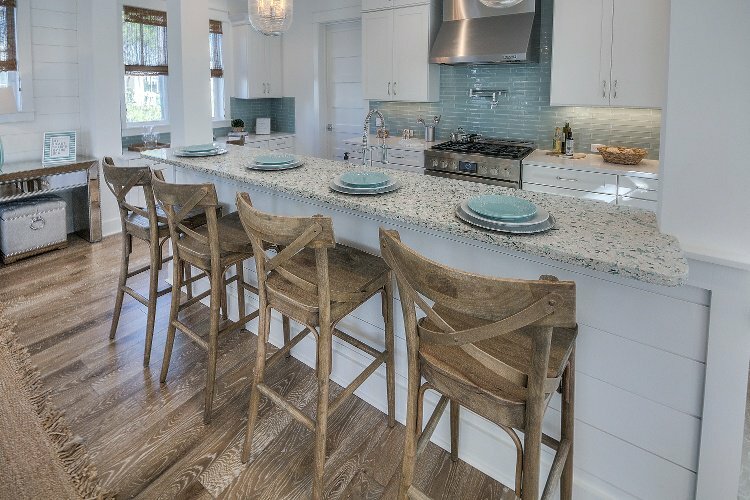 Weekly kept the focus on the Emerald Coast recycled glass kitchen bar top by using white quartz on the perimeter countertops. The room is like that first exhale when you walk through the door to a vacation home. Kitchen design by David Weekley Homes featuring Vetrazzo Emerald Coast countertops. 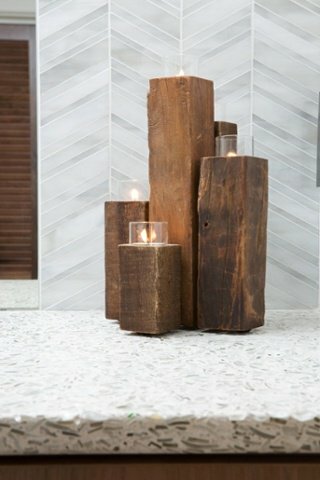 If you’re craving that coastal vibe don’t let your location (or the season around the corner) deter your design dreams. Bright and lively or soothing and subdued, there’s a coastal color palette out there for design lover, even the one who’s landlocked. Get more design inspirations in our new inspiration gallery. Download it here.